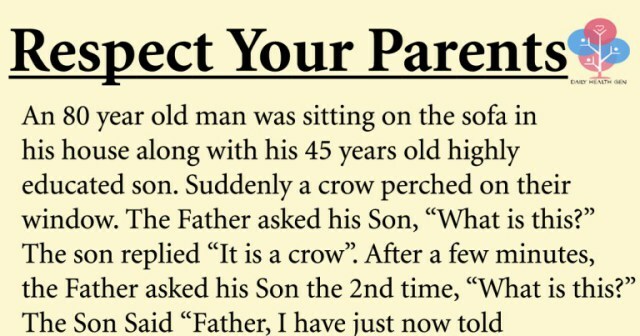 The Son replied “It is a crow”. After a few minutes, the Father asked his Son the 2nd time, “What is this?” The Son said “Father, I have just now told you “It’s a crow”. After a little while, the old Father again asked his Son the 3rd time, What is this?” At this time some expression of irritation was felt in the Son’s tone when he said to his Father with a rebuff. “It’s a crow, a crow, a crow”. This time the Son shouted at his Father, “Why do you keep asking me the same question again and again, although I have told you so many times ‘IT IS A CROW’. A little later the Father went to his room and came back with an old tattered diary, which he had maintained since his Son was born. On opening a page, he asked his Son to read that page. When the son read it, the following words were written in the diary. Today my little son aged three was sitting with me on the sofa, when a crow was sitting on the window. My Son asked me 23 times what it was, and I replied to him all 23 times that it was a Crow. I hugged him lovingly each time he asked me the same question again and again for 23 times. I did not at all feel irritated I rather felt affection for my innocent child”. If your parents attain old age, do not repulse them or look at them as a burden, but speak to them a gracious word, be cool, obedient, humble and kind to them. Be considerate to your parents. From today say this aloud, “I want to see my parents happy forever. They have cared for me ever since I was a little child. They have always showered their selfless love on me. They crossed all mountains and valleys without seeing the storm and heat to make me a person presentable in the society today”. Say a prayer to God, “I will serve my old parents in the BEST way.